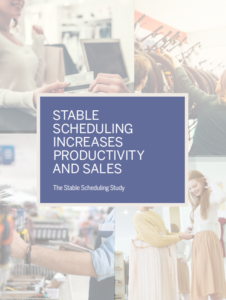 In the first randomized controlled experiment of a multi-component intervention designed to shift schedules in hourly retail jobs toward greater stability, the Stable Scheduling Study found that increasing the stability of work schedules is possible and even profitable in today’s competitive retail environment. Contrary to the widely held assumption that schedule instability for employees is an inevitable outcome of the volatile retail business, this study demonstrates that giving employees more stability is not only possible, but it can increase sales and labor productivity, and offer a high return on investment. The Stable Scheduling Study reflects a partnership between an interdisciplinary team that includes Joan C. Williams of the Center for WorkLife Law at University of California, Hastings College of the Law; Susan Lambert of the University of Chicago, School of Social Service Administration; and Saravanan Kesavan of the University of North Carolina Kenan-Flagler Business School; and the Gap, Inc. Elimination of On-calls: All stores were required to cease the practice of scheduling tentative shifts that may be cancelled only a few hours before they are scheduled to start. Tech-enabled Shift Swapping: Through an app called Shift Messenger, associates could swap shifts without requiring manager involvement, and managers could post additional shifts as the need arose. Stable Shift Structure: Managers endeavored to increase the consistency of shift start and end times in their store across days of the week. Core Scheduling: Managers aimed to improve the consistency of their associates’ shifts (days and times) from week to week. Part-time Plus: Managers offered a core team of associates a soft guarantee of 20 or more hours a week. Targeted Additional Staffing: The research team analyzed store data to identify which stores would be likely to increase their sales by adding additional staff to the sales floor at consistent specified times, and these stores received additional staffing hours at no cost to the store budget.